Film pioneered the art form of seeing motion on a screen, but it is far more than only visual. Score has long been one of the core pillars of cinema and – especially since the recent rise of blockbuster-like shows such as Breaking Bad, Sherlock and Westworld – of TV. The music directors choose to play alongside the shots they decide to show us can greatly influence our emotional connection to the scene and immerse us into the world imagined by the film or show. Moreover, since score is written specifically for the visuals it accompanies (as opposed to soundtrack, which is formed from pre-recorded songs that fit the overall theme of the movie or show), the director of a film or showrunners of a series have great power to work with the composer and form a score that can reflect upon and enhance what is being shown on screen. There are plenty of film scores that serve as great examples for how score should be written, both in terms of building an identity (the themes of Star Wars, The Good, The Bad And The Ugly and The Godfather stand out almost as entities in their own right) and in terms of conveying emotion (it’s impossible not to feel stressed or horrified when listening to Psycho‘s ‘The Murder‘). But in the world of TV, there is no show around today that has produced a more exceptional score than HBO’s Game of Thrones. One of the key uses of score is to create a recognisable theme from which the viewer can grasp the key issues and tone of the show, and which makes it stand out from everything else we watch. Here the Game of Thrones ‘Main Title’ theme really succeeds. Its immediacy hits you round the head to let you know you’re in for an epic, whilst the cello was deliberately picked as the main instrument to set it apart from the flutes or solo vocals found in so many other fantasy productions, and to give the titles a darker sound, in tune with the show’s more brutal and realistic style – from the get-go, you know this is no ordinary fantasy. Its sweeping, two-minute length also allows the listener to feel like they’re going on a journey and exploring Westeros, in tone with the show’s tendency to check in on a vast array of characters and locations. (In many ways, it’s reminiscent of the infamous Star Wars theme, which is similarly immediate, similarly sweeping, breaking style from the typical sci-fi title themes of the time in a similar fashion.) But more than that, the main title’s simplicity (an underlying four-note beat supporting a nine-note rhythm) allows it to be easily and subtly incorporated into a variety of other tracks to give them a sense of importance within the larger context of the show. All that said, and magnificent as Game of Thrones is, the title theme isn’t worth much if the rest of the score falls flat. Another use of score is to create a convincing atmosphere of time or place. The classic example of this in film would be the distinctive use of harmonicas in westerns. Of course, Game of Thrones isn’t set in the old west – but to attain an equally distinctive sound for shots of the Dothraki, composer Ramin Djawadi made use of the duduk (a kind of ancient woodwind flute which can trace its origins to the areas of Eastern Europe and Central Asia once conquered by the Mongols, the people who inspired the creation of the Dothraki), which subconsciously sets them apart from other scenes depicting Westeros, often accompanied by Western instruments like the harp and violin. Such “scoring by time/location” is incredibly effective, as it allows directors to almost effortlessly inform the viewer of where and when any given scene is taking place, and this is just one example of its use in Game of Thrones. 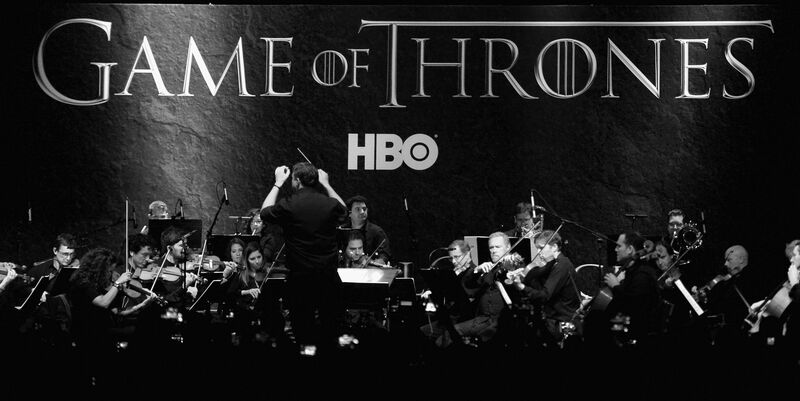 From composing different themes for each of the main houses to deliberately using more traditional and ancient instruments to capture the fantasy-world feel, Thrones has proven time and time again how powerful score can be in creating a convincing and immersive atmosphere for the screen. Then there are those tracks that really heighten the tension. Yes, I am speaking about Djawadi’s perfect scoring of Season 6’s fantastic ‘Battle of the Bastards’ and those moments with Jon Snow. I mean, watching a full line of cavalry charge at one of our favourite protagonists or seeing them nearly crushed by their own men is terrifying enough on its own, but what makes this moment even more nail-bittingly scary is how Djawadi played around with the score to play around with our emotions. Often, if we hear a particular piece of music accompanying a significant emotional event, we learn to associate that track with the joy, frustration, success, failure or whatever else that music is partnered with. Throughout Game of Thrones, there has been a particular theme that almost always plays during emotional farewells for the Stark family, from Robb leaving Bran in Season 1 to the “death” of Jon in Season 5 to Hodor’s sacrifice in Season 6. Again and again, this track is associated with heartbreak. So when we hear it, we know one of our favourite characters is about to meet their maker and we feel genuinely scared. Our association between that piece of score and the emotions we feel when we hear it is so powerful that we are tricked into thinking that Jon may actually die. Another fanstastic example of this is in the beautifully haunting ‘Rains of Castamere’. Originally written in the books but brought to life by the show, we hear it sung again and again by Lannister soldiers throughout the first three seasons, notably during the successful defence of King’s Landing in Season 2. So when we hear it played after the doors are locked and Roose’s chain-mail revealed at the Red Wedding, we know exactly that heartbreak is coming next (the lyrics singing about extinguishing rebellious houses reinforcing the point). It brilliantly shows that Djawadi truly understands how to use the power of score to play with our expectations and keep us engaged with what is being shown on screen. The last one on my list is the brilliant and utterly uncanny ‘Light of the Seven’. Score has the power to reinforce feelings when repeated, but it also has the power to throw us off when something completely new happens. This is what Djawadi achieves when he opens the track with the first use of piano in six seasons of show. We’ve never heard this instrument played before on Game of Thrones, so hearing it now, especially during a crucial plot-point – Cersei preparing for her trial – makes us sit up and pay attention. The way the track slowly builds and builds, with repeated, haunting refrains, only adds to the tension. Djawadi does a great job of gradually amplifying the piece towards a crescendo as we learn more and more about Cersei’s malevolent plan. The score keeps the viewer engaged here – this is a nearly 20-minute long scene, with clues as to what’s about to happen being dropped very slowly. This is yet another way score can be powerful: it builds tension, yes, but its masterful composition also keeps the viewer interested even when not much is happening on-screen. Until, of course, that explosive climax (pun intended). Scores can drastically yet deftly change the way we subconsciously react to the visuals of a show or film. Scores can be so subtle, yet so vital to a show. The psychological power of score is one of the most important cinematic techniques in film and TV, as there are so many ways in which it can influence our perception of what we are being shown. The emotional and thematic potential of these techniques is limitless, and I’ve only scratched the surface. So go watch your favourite film, or binge your favourite show, and pay careful attention to the score and how it affects – and even enhances – the way you react to a scene. How does that sound?